I just had the opportunity to review the most recent release, Rollin' With It, from John McNamara and it's smooth. Opening with R&B flavored One, Two of a Kind, John McNamara on lead vocal and guitar sets a terrific stage. Backed by Steve Potts on drums, Michael Toles on guitar, James "Jimi" Kinard on bass, Lester Snell on keys, Marc Franklin on trumpet, Lannie McMillan on tenor sax and Jim Spake on bari sax, these guy have a great mix of rock and blues. With a feel of Little Willie John Bad Reputation swings. Franklin really adds a nice punch and McMillan and Spake bottom. Steve Cropper like guitar riffs adds that gritty feel that makes the track great. Soul track, Ask Me Nothing (But about the Blues) really showcases McNamara's voice nicely and the sax work of Spake adds a nice heft. I really like the guitar work of McNamara on this track in particular making it one of my favorites on the release. Slinky, Under The Weight Of The Moon, weaves nicely with rich horn work blending R&B with stinging guitar riffs reminiscent of Texas style blues. Very nice. With horns blazing, Security really takes a turn more in the direction of Wilson Pickett. This release is really hot and McNamara has great feel. With a full horn section call and responding with guitar, this track has it all. Another of my favorite tracks on the release is Blind Man. I really like McNamara's vocals in balance with the horns and the soulful rhythm is spot on, not to mention McNamara's guitar punctuation... think Muscle Shoals sessions. You Wouldn't Wanna Know is a powerful track with a driving beat, bluesy guitar riffs and tight vocals. Wrapping the release is the beautiful, Suffering with the Blues. 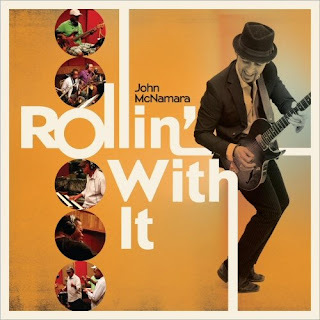 With rich orchestration and McNamara way out front, this track is an excellent closer for a superior release.